I first encountered him here, in high school English class. Then I ran into him in New York, two years ago in the Cathedral Church of Saint John the Divine. probably my favourite picture from the trip, all because of the light. A section of the floor had over a dozen plaques dedicated to American poets. He was inside and he was outside the cathedral. 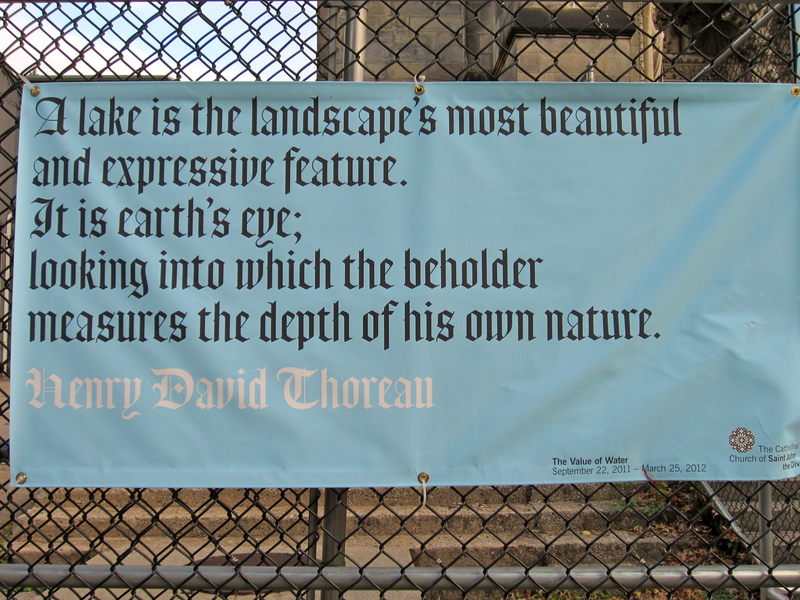 I’ve remembered these lines since that high school English class, but I never read Thoreau for myself. 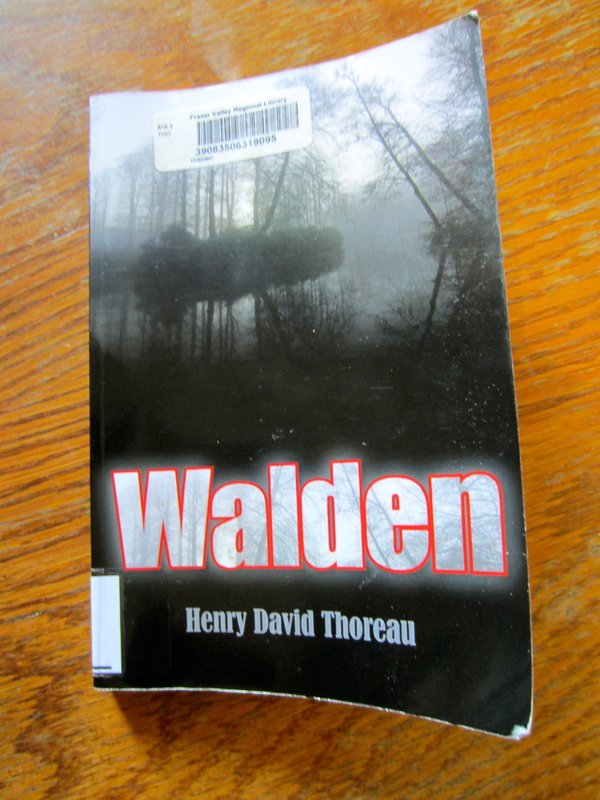 After these encounters accumulated for me recently, it was about time to read Walden. 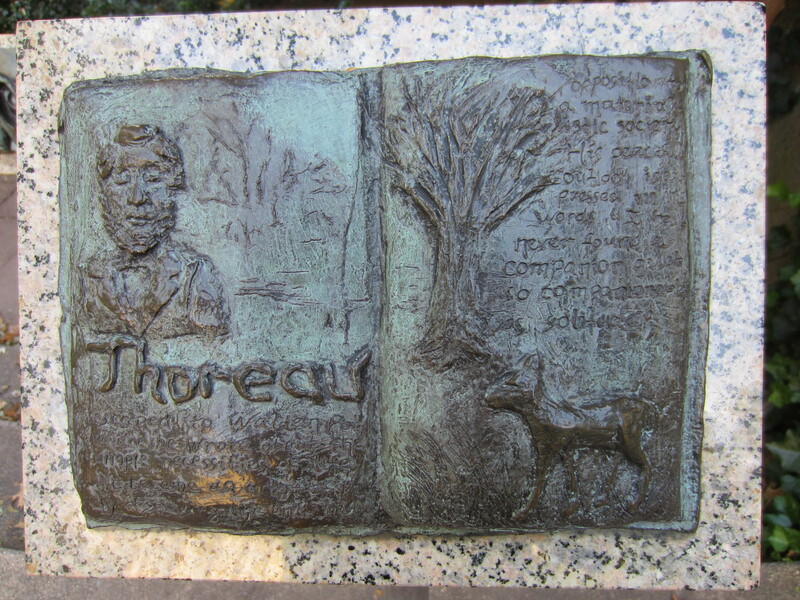 Henry David Thoreau went to the woods in 1854 and built a log cabin on the edge of Walden Pond near Concord, Massachusetts. His writing is part autobiography, part social critique of the consumerist lifestyle (yes, even back then). 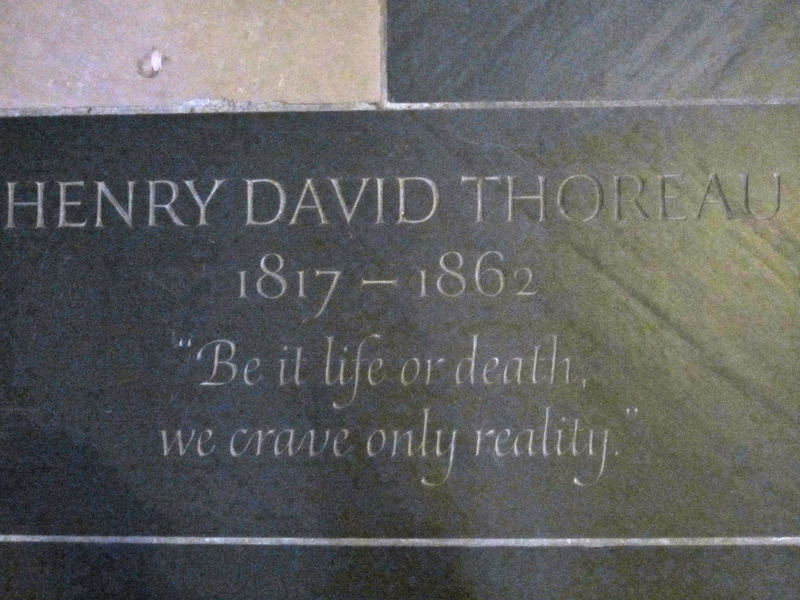 Thoreau is one of the central figures of Transcendentalism, a philosophical movement begun in New England and influenced by Romanticism, in which divinity was thought to pervade all nature and humanity. Man is believed to be his best when he’s living independently, without society and its institutions that ultimately corrupt his inherent goodness and purity. Thoreau calls his two years at Walden an experiment in living simply and in solitude, where he could think, read, and reflect. He confesses a few times how much he liked being alone (too much alone, in my opinion) – yet not enough that he stayed there forever. I left the woods for as good reason as I went there. Perhaps it seemed to me that I had several more lives to live, and could not spare any more time for that one. However mean your life is, do not shun it and call it hard names. It is not so bad as you are. It looks poorest when you are richest. The fault-finder will find faults even in paradise. Love your life, poor as it is. You may perhaps have some pleasant, thrilling, glorious hours, even in a poorhouse. The setting sun is reflected from the windows of the almshouse as brightly as from the rich man’s abode. Cultivate poverty like a garden herb, like a sage. Do not trouble yourself to get new things, whether clothes or friends. Turn the old; return to them. Things do not change; we change. Sell your clothes and keep your thoughts. The life in us is like the water in the river. It may rise this year higher than man has ever known it, and flood the parched uplands; even this may be the eventful year, which will drown out all our muskrats. I do not say that John or Jonathan will realize all this; but such is the character of that morrow which mere lapse of time can never make dawn. The light which puts out our eyes is darkness to us. Only that day dawns to which we are awake. There is more day to dawn. The sun is but a morning star. 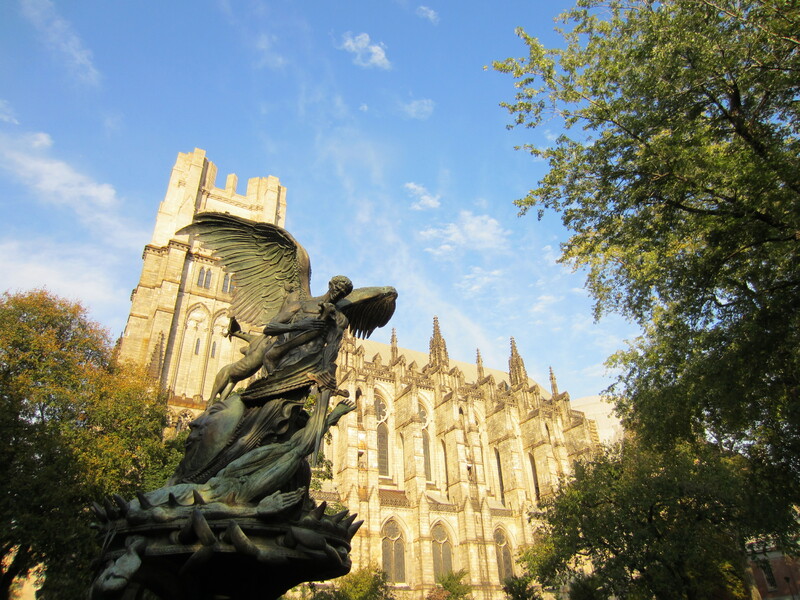 This entry was posted in Space & Society and tagged American Literature, Cathedral Church of Saint John the Divine, Dead Poet's Society, Henry David Thoreau, Transcendentalism, Walden, Walden Pond by Charlene Kwiatkowski. Bookmark the permalink.